Flex Wheeler, nicknamed the ‘Sultan of Symmetry’, is known for being one of the greatest bodybuilders to have never won a Mr Olympia title. We’ll let him off on this one, seeing as he was up against Dorian Yates and the great Ronnie Coleman (what an era!). He’s also considered to have built one of the most aesthetically pleasing physiques the sport has ever seen. Flex had huge, full muscle bellies combined with a tiny waist and small joints. Every muscle was developed, creating flawless symmetry and immaculate proportions. In terms of aesthetics, Flex was very close to perfection. Now, to become one of the best bodybuilders in the world like Flex, you’ve got to have beyond exceptional genetics, use anabolic steroids and train hard in the gym for a very long time. During 1998, BALCO laboratories conducted a study that analysed 62 men who previously made incredible gains in muscle mass from lifting weights. Of these 62 men, nine were diagnosed with having a myostatin mutation. Myostatin is a protein that suppresses myogenesis. In English, this means myostatin basically prevents the body from building muscle. Flex was one of the nine bodybuilders who was deficient in this gene. In fact, out of the nine men who had this myostatin deficiency, Flex had the rarest kind – the ‘exon 2’ gene. This basically means he had significantly more muscle fibers than the other test subjects in this study… and ridiculously more than me and you! Those who are affected by this genetic condition (‘condition’ – oh the irony!) build twice the amount of muscle compared to a normal person (1). This study was published on the official BALCO website, but it can no longer be seen due to them removing it. Luckily, though, the statement was copied and uploaded onto several websites before they took their site down, thus it can still be viewed (2). Some of you may recall a dog named Wendy the whippet. Wendy became somewhat famous due to her abnormal muscular appearance and was even nicknamed the ‘dog version of Arnold Schwarzenegger’ and the ‘Incredible Hulk of Hounds’ (3). Okay, you’re having a hard time believing anything I say right now, but this genuinely is true! She weighed double the amount of a normal whippet and had twice the amount of muscle. So how come Wendy was so jacked?! She also had a myostatin deficiency – just like Flex. Belgian Blue and Piedmontese are two examples of cattle who also have myostatin deficient genetics. These breeds have up to 40% more muscle than other cattle (4) and as a result the Belgian Blues are known as ‘monster cows’. It’s important to note that myostatin deficiencies don’t just increase muscle mass but also make a person/animal more ripped. This is because extremely low levels of myostatin increases the body’s ability to metabolise fat. Thus, cattle with such myostatin deficiencies are lean meat choices. 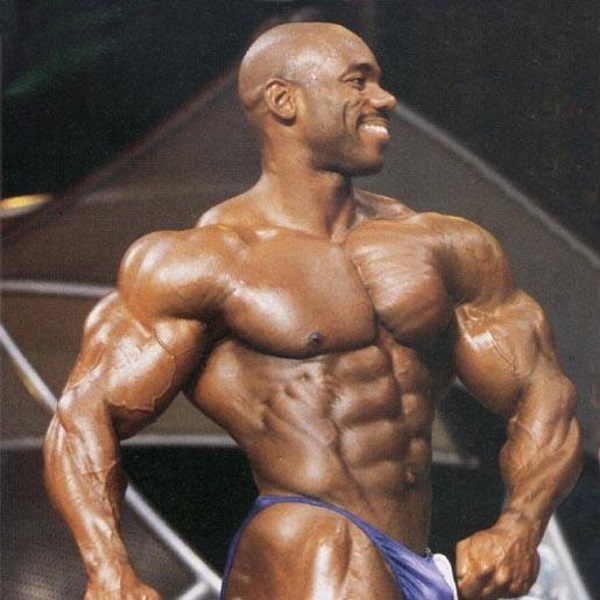 But if Flex Wheeler had such amazing genetics why wasn’t he the greatest bodybuilder of all time? Well, if you’ve ever seen any of Flex Wheeler’s DVDs such as Hardbody, it’s clear that he trained very light, and without much intensity. He often preferred using lighter weights and barely broke sweat. In his training footage it’s also evident that Flex opted for easy exercises, choosing to use exercises like the leg press instead of squats. Lee Priest, when speaking about training legs with Flex, confirmed this approach, saying he “didn’t want to go heavy, he wanted to do the light stuff” (5). Thus, it could be argued that because of Flex’s unparalleled genetics, he didn’t have to work as hard as his bodybuilding peers in order to achieve his success. Flex’s philosophy on training light in this way was the opposite to Ronnie Coleman’s, for example. He and others were known to train as heavy and as hard as possible, every time they entered a gym. Flex’s genetics could also explain why he’s still in great shape even now at 50 years old. He’s inevitably shrunk since he stopped cycling, but he remains big. Whereas other guys when they stop juicing and stop lifting heavy can really deteriorate, and no longer look impressive as nattys. Not all Mr Olympia bodybuilders have been tested for such mutations, however some of them may actually have similar genetics without even knowing it. After all, without BALCO’s study, Flex and the other bodybuilders participating wouldn’t have known any different. Can you imagine what they’d discover if they did tests on Ronnie Coleman? His myostatin cells are probably so deficient they’re in a minus! There ARE myostatin supplements on the market right now that work at lowering your body’s ability to produce this protein. At this point try to stop your brain from bouncing out of your skull from the excitement of your future gains! Using Myostatin inhibitor supplements to decrease your myostatin is similar to using testosterone boosters to get the same effects from using steroids. Testosterone boosters can increase your testosterone by a certain percentage, but not enough to get the same results as anabolic steroids. Hence how some myostatin inhibor supplements are receiving poor reviews online with customers complaining that they didn’t notice a thing. This is because the supplement dose isn’t high enough to reduce myostatin levels low enough to see BIG gains in muscle size. So how much do you need to reduce myostatin levels by in order to see results? Dr Welle published a study measuring the affect of myostatin levels and muscle mass in mice. He concluded that anything which decreases myostatin by 60% or less is pretty much useless (if your goal is to build muscle). But don’t despair yet my fellow gym rats, Dr Welle did find a ‘sweet spot’ in his study. When total myostatin levels reached 5-10% (so a 90%-95% drop), the mice gained 25% of lean muscle tissue in 12 weeks or less! This is the same as a bodybuilder weighing 80kg, and gaining 20kg of pure muscle, taking him up to 100kg within a few months. However, Welle did mention some side effects in the mice come the end of the study. He noticed that the mice had a reduction in collagen, a protein needed for your body to keep tendons/bones/ligaments strong. As a result of this decrease in collagen, Welle noted that the mice’s tendons (tissues that attach bone to muscle) became increasingly brittle. More brittle tendons increase the chances of tissues snapping/rupturing, which, as you can imagine, can be excruciatingly painful. The other drawback was that Welle believed adults would need to continue taking such supplements if they wanted to keep their gains. Thus the muscle built in humans via lowering myostatin wouldn’t be permanent (similar to steroids). He has this theory because when adults have experienced increases in muscle mass due to lower myostatin levels, it’s been sarcoplasmic hypertrophy. Sarcoplasmic hypertrophy is when glycogen storage increases the size of the muscle cell, making it essentially temporary growth, meaning if the myostatin level were to go back to normal, the glycogen in the muscle would decrease and mass would be lost. As opposed to myofibrillar hypertrophy, which increases the actual size and number of the muscle fibres, and is permanent. In regard to his genetics for building muscle, Flex Wheeler is simply a phenomenon. I want to see a study done on a bunch of hardgainers lifting weights three times a week and Flex Wheeler just LOOKING at dumbbells three times a week. I wonder who would build more muscle? Seriously though, just imagine how jacked Flex could’ve been if he did years and years of serious bulking combined with a 100% workout intensity. This article hopefully will emphasise that bodybuilding is a journey with yourself. Although we’re all human, we all have extremely different genetics. Also, we learn in Flex’s case that no matter how incredible your genetics are, it takes more than DNA to be a champion. Anyhow, I hope you enjoyed this article.